I remember sitting in the butterfly pose on the gym floor of the elementary school. I was wearing a pink leotard with a floral diamond embellishment on the chest and a pink tutu circled my 4-year-old waist. It was my first ballet class. The ballet teacher towered over us as she walked in between us. She stopped at me and made a brusque corrective comment, pushed down on my legs to deepen my stretch, and with her hands she not only firmly pushed down my legs but my spirit, too. I felt scared and ashamed by what I felt to be a public scolding. I did not want to go back. And I didn’t. Over 25 years later, I was newly married and teaching. My teaching job was stressful and I needed a hobby to take my mind off the day. As fate would have it, one of my friends was taking ballet classes and I admired how she moved with such grace. Even though I had always labeled myself as uncoordinated and clumsy (probably due to my first ballet class experience), I went to my first adult beginners ballet class with my friend as my inspiration and my dream to finally learn to pirouette. Once I was in class and the introductions were made, I quickly learned it was not as much of a beginner’s ballet class as it was a refresher class for adults who did ballet as a child. 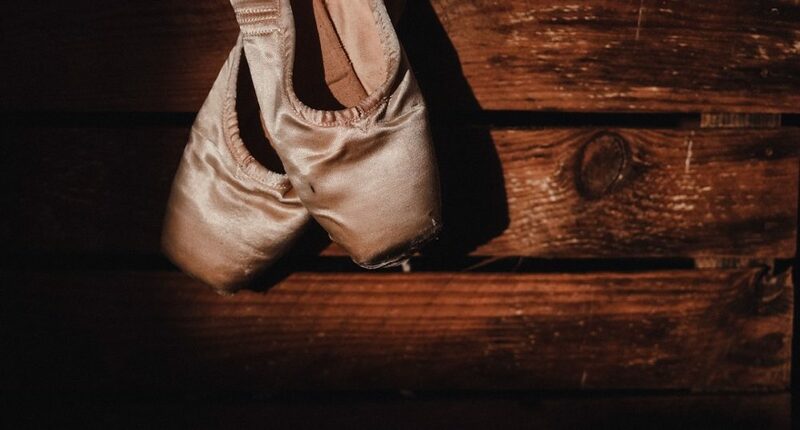 I knew it would be awkward since my ballet career began and ended in one day, but I made a commitment to myself to persevere through the discomfort (albeit embarrassment), instead of running away from it. At the very least, I committed to stay until the six lessons on my punch card were punched. Wouldn’t you know it, I ended up punching through two years of punch cards before moving away. I keep the punch cards as a reminder of my accomplishment. During those classes, I struggled through the basics of posture, tendu and plié, but my teacher’s encouragement gave me hope in the small signs of progress I made each week. The very positions I was learning began to change my outward and inward posture, healing the shame I carried with me since childhood. The dance variations provided beautiful metaphors that replaced old routines I had practiced my whole life: Instead of hanging my head in shame and running away when I failed or made mistakes, I held my head high with my chin up and stopped apologizing as I made mistakes. Through dance class and life, I learned to practice the movement until it became a habit to confidently finish, no matter how it went. Now, I have a daughter who is a year and half. My dream for her is to grow up feeling safe to fail, to persevere through discomfort, and to be willing to face her fears – because that is what she’ll see me practicing. I still cannot pirouette and I may never truly accept that it’s too late for me to be the Sugar Plum Fairy. But I have faced the shame I felt as a child and I am no longer sitting on the floor in the butterfly position. My spirit is soaring and my feet are in relevé. Heather Pegors is a stay at home mom with her daughter in Cañon City, Colorado, where she hosts frequent kitchen dance parties with her family while they make meals. She and her husband serve as full time missionaries with Worldview Academy, a summer camp teaching Biblical worldview, leadership and apologetics, and during the school year with Worldview at the Abbey, a classical education gap year program in Cañon City, Colorado.